We survived the chicken pox, we got our new spiral mixer and started baking again! The first two batches where two loaves of Pain Rustique which is our favourite recipe for a white yeast bread (see Jeffrey Hamelman and his excellent book Bread). With the second batch we made two loaves of sourdough using a rye starter. Both batches of bread came out beautifully. Our new Haussler Alpha mixer kneads the dough much better and fluffier in a shorter time than our KitchenAid mixer. The Alpha mixer is beautifully made and very sturdy and we have fine results with it, but it has one disadvantage and that is that with small doughs they tent to climb/stick to the hook and just spin around without any kneading action. This problem is more prominent with smaller quantities of dough 500 – 1,5 kg and not when making a full batch of about 4.5 kg in one go. We have removed the plastic security cover so we can ‘press / hold’ the dough down with a very big spatula during kneading. This helps to get a better kneaded dough even with the full 5kg quantity of dough. We have the one speed Alpha, there is also a two speed available, but at this moment we see no need for two speeds when making french type artisan breads. 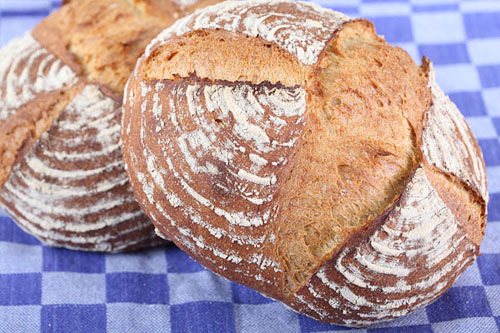 Click here to see for the our latest version of the recipe of the Pain Rustique! Hello! It has been quite a while since anyone commented, I just wanted to say the Häussler now introduced a small breaker bar on the dough hook which is supposed to stop it from climbing up, look into buy thag that new dough hook! I just bought the mixer but haven’t got it in the mail yet, will let u know how it does! Yes, we have bought our mixer over 8 years ago (still going strong) and this post is of that age too. Thank you so much for sharing this info, it sounds like something to look into and maybe ask the people of Haussler if the dough hook is available separately. hello! after using the mixer almost 5 days a week, i have come to find that it is a great mixer for someone who wants a spiral mixer, with the new feature of the breaker bar on the hook i found that my dough only traveled up the hook once, it was because i was making a dough with 60% biga. overall i enjoy the mixer but not the price i paid for it, if it was 500$ less then it would be worth it. Happy baking! I was searching for reviews on the alpha and found this page. I looked around and couldn’t find any newer posts about spiral mixers on your website. It looks like it has been over 3 years since the last comment and I’m wondering if you are still using the Alpha or if you are now using a different mixer. I see in an earlier comment you mentioned the KA10 but I guess Haussler doesn’t make that one anymore as I couldn’t find it on their website. The KA15 seems a little bigger then what I’m looking for. Also I’m looking around your site it looks like you have shared a lot of good information. Thank you for taking the time to do that. Yes we are still using the Alpha and except for the mentioning of the dough sticking to the hook, the machine itself is still as beautiful and trustworthy as ever (so we would recommend looking for a mixer that has a standing knife in the bowl that cuts through the dough to avoid this ‘problem’. The quality of the machine is just excellent. Next to the alpha we also use a Bear Teddy for smaller dough quantities and we really like it too. We would recommend it for anyone who is considering buying a bigger KitchenAid for example and to at least look at this mixer before making a decision. We have not been looking at bigger mixers recently so we are not really up to speed with the best choice at the moment. We have heard not much favorable stories about Chinese brands and better ones about Italian mixers like from the brand Mecnosud for example. They also seem to be reasonably priced. have you tried spraying your spiral mixer with oil to stop the dough sticking? I just wondered where the spiral mixer story ended. I am wondering about trading up to semi professional equipment, so interested to know. I haven’t done much research yet. Did you look at the Rofco product? We did try that but the problem is the oil being absorb by the dough pretty quickly. Ed has now developed a ‘technique’ (sticking a long bread knife a little away from the spiral that acts as a cutting blade you also can find in some mixers) that is working very well at the moment. Development of the dough has improved even further that way. But it would be ideal to have this situation without holding on to something yourself of course. With Rofco product do you mean the Rofco mixers? I am sorry to say we do not know much about them and also do not know people who own one. Ed only remembers the owner of Rofco telling they ‘make’ them themselves. About the ovens we know a LOT! But they do have an English speaking employee so you can fire some questions at them, maybe ask for a reference. If you need to know anything more, just ask! Dit kwam ik tegen in een Duitse webshop. Zou dit jullie deeg-blijft-aan-de-haak-hangen-probleem bij de Haussler misschien verhelpen? Dankjewel! Laten we nu net hetzelfde zijn tegengekomen twee dagen geleden toen we naar heel iets anders op zoek waren, een ‘super-peel’. Dit schijfje zorgt er in ieder geval voor dat het deeg niet de machine in kan klimmen en wie weet helpt het inderdaad ook nog tegen het ‘hangen’. Marieke – I noted your comment that you would not buy this model again. As I am looking to buy a mixer and was very impressed with the positive comments you initially had I was surprised to read this. Can you help me to understand your reasons for not getting this again? I was actually ready to buy one and was already trading notes with the office in Germany. Thanks. Yes Bob, we will try to explain. We have baked a lot of bread and made a lot of dough since purchasing the alpha. I have to say that during that time we have become more experienced and also more critical of what to look for in a mixer. The Alpha mixer was such a step up from the Kitchen Aid we were using before that. Like we said in the comment above the Alpha mixer is beautifully made and very sturdy, nothing ever broken or anything and we have fine results with it, but it has one disadvantage and that is that certain doughs (esp. with wetter doughs) tend to stick to the hook. This problem is more prominent with smaller quantities of dough 500 -1,5 kg and not so much (or sometimes not at all) when making a full batch of about 4.5 kg in one go. We noticed that if we helped the dough by pressing it down now and then the dough became even better. So if we had to buy a new mixer at this moment in time, we would not choose the Alpha again for this reason, because now we would be looking for the optimum mixer for the type of baking we do the most and ideally not having to help the smaller batches of dough stay down in the bowl to get the optimum knead. Haussler has another type of mixer, the KA10, of maximum 10 kg capacity that is available with two speed and people claim it does not have this problem. But we have no first hand experience ourselves with this model. I believe it is only slightly more expensive. If you want you can read more about this on the Hauessler website here: www.backdorf.de/index…?Meinungen (you may have to translate with google translate). Hope this helps with your decision making process. Thanks that helps quite an bit! dough sticking to the hook? The Alpha mixer is beautifully made and very sturdy and we have fine results with it, but!! it has one disadvantage and that is that with certain doughs (esp. with wetter doughs) they tend to stick to the hook. This problem is more prominent with smaller quantities of dough 500 -1,5 kg and not so much when making a full batch of about 4.5 kg in one go. We have the one speed Alpha, there is also a two speed available. But if we had to buy a new mixer at this moment in time, we would not choose the Alpha again. Haussler has another type of mixer, the KA10, of maximum 10 kg capacity that is available with two speed and people claim it does not have this problem. You can read about it here: www.backdorf.de/index…?Meinungen (you may have to translate with google translate). Dank voor jullie reactie. Ik heb inmiddels een offerte voor de spiraalkneder binnen. De digitale thermometer heb ik inmiddels besteld bij amazon en is verzonden. Ik heb nog een vraag over de deegtemperatuur. Ik begrijp dat je het zodanig moet zien te regelen dat je deeg een starttemperatuur heeft van 24 graden. Na het kneden zet je het deeg weg zodat het kan rijzen. Als je het deeg wegzet in een wat koudere ruimte dan 24 graden (en dat is volgens mij het geval in de meeste huiskamers en zeker in bijruimten) daalt de temperatuur van het deeg dan niet teveel gedurende het rijzen? Of geldt dat het deeg zichzelf op temperatuur houdt? Kortom: de vraag is nu niet meer hoe ik de juiste temperatuur krijg maar hoe ik deze behoud. Van die thermometer ga je nog veel plezier hebben! Wat betreft de deegtemperatuur is het natuurlijk ideaal als de ruimte zelf ook lekker warm is. Als het wat kouder is kun je ervoor zorgen dat je deeg initieel nog een paar graden warmer is door wat warmer water te gebruiken. Als je wat grotere hoeveelheden deeg maakt (en dat doe je met de Rofco en je nieuwe mixer zeker) heeft het deeg ook wel genoeg volume om warmte wat langer vast te houden. Met je thermometer kun je goed meten wat je deeg doet en zo leer je gaandeweg te optimaliseren. Als Rofco-eigenaar heb je het bijkomende voordeel dat de oven ook je ruimte bij-verwarmt. Bovendien kun je, als het wat kouder is, je deeg boven op je oven laten rijzen. Even een theedoek of iets dergelijks op de oven leggen en daar je bak met deeg, afgedekt, bovenop. Werkt perfect. Dank voor jullie snelle reactie! Naar aanleiding hiervan ben ik er uit. Ik ga voor de Häusler KA 10; je kunt ‘m met twee snelheden krijgen, maar dan is ie op krachtstroom. Met 1 snelheid functioneert hij op 230 V. Dat lijkt me wel voldoende, toch? Deze aansluiting is ook praktischer, aangezien je de machine dan gewoon in de keuken kunt gebruiken. De machine heeft een afneembare kom en spiraal. Dus gemakkelijk te wassen. Ik las ergens op deze site dat jullie uitgaan van een rijstemperatuur van 24 graden. Hoe krijgen jullie dit voor elkaar? Of staat dat misschien ergens op deze site? Ik heb op het bakkersforum gelezen dat sommigen een rijskast hebben. Is dat misschien het geheim? Spannend! We zijn heel benieuwd naar je ervaringen. Wij hebben ook om dezelfde praktische redenen voor de 1 snelheid gekozen. Die tweede snelheid is in termen van omwentelingen per minuut ook wel zeer snel en het rustigere kneden van de 1 snelheid past ook goed bij het type brood dat we maken. Het lijkt een goede balans tussen de high speed spiraalkneders en de langzame vorkkneders. Te langzaam kneden oxideert het deeg te veel (het wordt steeds witter en je krijgt smaakverlies). Te snel kneden verwarmt het deeg te veel door wrijving. (indicatie: voor gemiddelde glutenontwikkeling heb je 900 tot 1000 omwentelingen nodig). Hoop dat de KA snel komt! Vorige week is mijn Rofco oven, type B30, afgeleverd en ik ben er helemaal blij mee! Maar nu loop ik tegen de grenzen van mijn Kitchen Aid mixer aan. Daarom wil ik een spiraalmixer kopen. Nu lees ik bij jullie allemaal positieve berichten over de Häussler Alpha. Als ik op de website van deze firma bij de klantenmeningen kijk, lees ik dat er diverse personen klagen over het ‘omhoog kruipen’ van het deeg. Ze adviseren dan ook om EUR 200,– meer uit te geven en te gaan voor de iets grotere versie de KA 10. Wat is jullie ervaring met het ‘omhoog kruipen’ van het deeg? Ik vind het lastig een keuze te maken. Het is toch een aardige investering en ik wil wel een goede keuze maken. Goed nieuws, alweer een Rofco adept erbij! Vele jaren bakplezier gewenst! Dat omhoog kruipen van het deeg klopt wel een beetje. Het is een prachtmachine met bijbehorend resultaat maar dat kruipen herkennen we wel, het deeg kruipt niet het loopwerk in gelukkig, maar gaat wel omhoog richting het afdekplaatje van de haak. Nu je de keuze hebt en helemaal in combinatie met de B30 is de Alpha waarschijnlijk niet meer de juiste keuze (wij hebben hem in combi met de B20 gekocht). De hoofdreden voor ons om nu niet voor de Alpha te kiezen zou zijn dat ze niet de capaciteit heeft om genoeg deeg te maken om je B30 te vullen. Wat we heel fijn vinden aan de Alpha, en wat elke andere mixer voor ons ook zou moeten hebben, is een afneembare kom. Een vaste kom moet je ter plekke zien schoon te krijgen en met het vele natte deeg dat wij maken zou dat echt veel gedoe zijn. Ook iets om over na te denken. Kortom een mixer met losse kom, qua capaciteit passend bij de B30 en zonder het omhoog kruipen zou in onze ogen de ideale mixer moeten opleveren. Voor zover ik weet voldoet de KA10 daar wel aan. En deze Duitse machines zijn zoveel mooier gemaakt dan de (weliswaar goedkopere) alternatieven. We zijn zelf ook geïnteresseerd om de klantenmeningen te lezen, heb je de link voor ons waar deze staan? Thank you so much for your response. I was very conflicted and not sure which of the Alpha models I should go with. I am very happy with you answer and will finalize my purchase tomorrow. Hi Marike: I just wanted to touch base with you to see how your Haussler Alpha Bread Dough Machine was working. Have you had any problems with yours. I am in the process of making my purchase and not sure if I should just go with the standard alpha, or go with the two speed. From what they told me the two speed works better on whole wheat flours. What is your experience with using whole wheat flour in your machine. I appreciate your feedback. We own the one speed mixer which is working perfectly for two straight years, being used for about 12-18 breads each week. Our mixer rotates at about 110 rpm, normally a two speed mixer has an 100rpm and a 200rpm mode. I do not know the rpms of the Alpha 2G mixer. The high speed mixers are an industry invention to speed up the bread making process. By mixing at 200 rpm you can cut mixing time in half and still bake a bread. There are also other ‘advantages’ in the speed of gluten development at 200 rpm but all result in a higher yield without a higher quality. So as a home baker you do not need a high speed mixer as the slower mixing more mimics the movement of the hands. However you can not go wrong with either mixer, but I doubt you will use the 200rpm second gear much…I can tell you 110 rpm looks already quite fast. Using whole wheat is no problem at all, even thick rye paste-like dough it handles brilliant. Can I buy a Haussler spiral mixer here in the states?? An internet search has not been succesful for a dealer. Or, is the Kenwood 2600 watt available here?? I think they ship to the US directly from Gerrmany. I can truly say it is a wonderful machine that works well with small and big quantities of dough. We do not have any experience with the ken wood. Kan je uitleggen waarom en hoe je dat doet? Ik heb de pain rustique uit Hamelman (de pdf; het boek is besteld) gemaakt. Qua smaak is het geweldig; bijna romig… Het deeg was alleen vrij nat en plakkerig en leverde toch een vrij compacte binnenkant op. Het recept gaat uit van 69% hydration in het uiteindelijke deeg. Jij past dat aan naar 65%. Is het verschil in hydration goed te merken? Zorgt het niet voor een nog compactere binnenkant? Het meel uit Nederland/Europa neemt aanzienlijk minder vocht op dan uit Amerika, dat kan zo 5 tot 6% schelen. Dat lijkt misschien weinig, echter 5% is het verschil tussen een onhandelbaar nat deeg wat in elkaar zakt of een mooi deeg wat net niet te droog en te nat is. Ik ben zelf van de school ‘hoe natter hoe beter’ echter een vrijstaand brood van 80% is helaas niet mogelijk, dus dan moet je wel terug naar +/- 65% voor ons Europese meel. Ik denk dat je compacte binnenkant komt omdat het niet genoeg gerezen is. Was je deeg tijdens de rijs wel rond de 24 graden, want alle tijden van bijna al onze recepten gaan uit van een deeg temperatuur van 24 graden tijdens de bulk fermentatie. Zie ons stuk over deegtemperatuur; www.weekendbakery.com/posts…mperature/ voor meer info. Hi Marieke: Thank you so much for responding and providing me with all the information. I really do love this machine, and I am considering this machine and one similar to it from a company called TMB Micro spiral SP5 mixer. I will inquire. Thanks again Ann F.
And now we are intrigued by the TMB. Ed has something to check out again! For anyone interested in possibly purchasing this product the price is now $ 1864.72. This does include the price of shipping and it comes directly from the company in Germany. Hi Marike: I have been looking for this Haussler Bread Kneading machine and can’t seem to find it anywhere in the US. Where did you purchase yours and what is the price.? I have researched many bread kneading machines for residential use and I have not come across one that is 100% positive reviews. It’s in German but you could send them a message in English and find out if they ever delivered to the US or have a distributor. The price of a mixer like ours is about 1500 euros (not cheap I know). We saw other brands but this one had a detachable bowl and you can lift and remove the spiral, so really easy cleaning. The cheaper ones didn’t have that and this model is beautifully made compared to models we saw that cost 800 euro (these ‘cheaper’ ones are used a lot by small pizza bakers). The alpha kneads 5 kilo as easy as 500 grams so we can make 1 loaf or 6 and it does the job. Maybe it is something for you to check out the whole sale companies that sell mixers to small pizza makers because they use the machines that handle the smaller amounts of dough. If you look at mixers aimed at other bakers they usually start with higher volumes (80 pounds or more). So spiral mixers for pizza places can also be a way forward maybe. Good luck with the quest and happy baking! Very good result, just one thing: Does this kneader mange to knead a small quatitie of one and half kilo dough? In advance, thanks for help. Yes David, I even make pizza dough in it with quantities as small as half a kilo and the mixer handles this beautifully. I also make small batches of dough (between 1 and 1.5 kilo) for other recipes. I think I can safely say it does the job for any amount of dough between 0.5 and 5 kilo. MMMMM…your breads look so wonderfully delicious! Your Spiral mixer looks great: have a lot of fun with it! I have a Kenwood 2600 watt, a kenwood major, it never failed me!! I make all of my doughs in it!